Dorothy and her ruby slippers would have been right at home in Anchorage this week. After watching garbage cans blow down the street, my propane grill do a face plant on the porch and more than one bird being blown backwards, seeing the old green witch on a bicycle whipping past the front stoop would have fit right in. I read the skiing reports with the small hope that some part of town had been saved, but alas, sticks, twigs, cones, debris, uncovered ice and bare dirt were common in the comments. 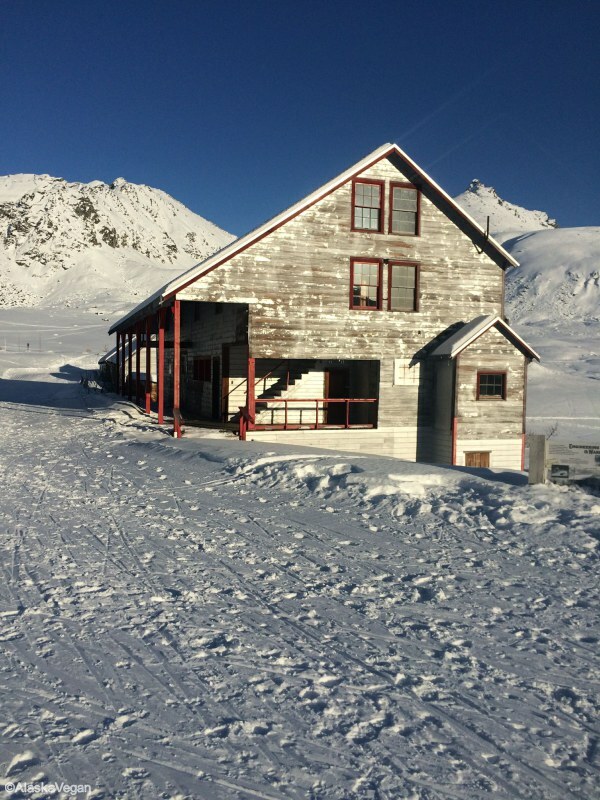 I do love the Alaska spirit though, in that every single trail had been skied and reported on. Difficult as it was, people were clearly out making the best of it and encouraging others to do the same. Apparently the blustery conditions had merely presented a chance to practice the ‘stick slalom’, and as one optimist pointed out “atleast it’s not raining!”. True. In Alaska, it could always be worse! While the real Alaskans were out stick jumping and ice skiing, I spent the weekend doing errands, catching up on house chores and cooking comfort food, like this oddly, but aptly named Chickenless Pot Pieless. It’s everything that chicken pot pie should be: chicken free, dairy free and frustration free while still creamy, comforting and downright crave-able. Saute onions, celery, carrots and parsnips over medium high heat for 7-10 minutes, adding small amounts of water as needed to prevent sticking. When vegetables start to soften, add thyme, saute thirty seconds more, then add enough stock or water to barely cover vegetables (3-4 cups liquid). Bring to a low boil, reduce heat and simmer until vegetables are easily pierced with a fork. 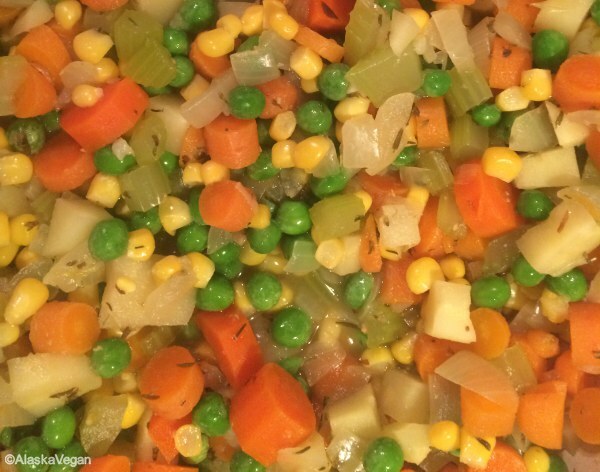 Add corn and peas to simmering vegetables and allow to cook for 3-5 minutes. Meanwhile, blend cashews, soymilk (or water), cornstarch, yeast flakes and onion powder in a high speed blender until completely smooth. Once vegetables are fork-tender, and frozen veggies have cooked, add cashew soymilk mix and stir constantly until thickened (3-4 minutes). Season to taste and serve over mashed potatoes, brown rice or bedding of your choice! I like to use Delisa Renideo’s Chicken-less Seasoning and water to make the broth for this stock. I generally use 2-3 teaspoons of the mixture per cup of water, but taste and adjust according to your preferences. Although there is salt in the mixture, it’s not especially salty, so you may have to adjust the seasoning at the end to your liking. As I type this out, the weather lady has just announced that we should expect warming conditions and rain in the coming week. Sigh. Well, at least it won’t be windy….. 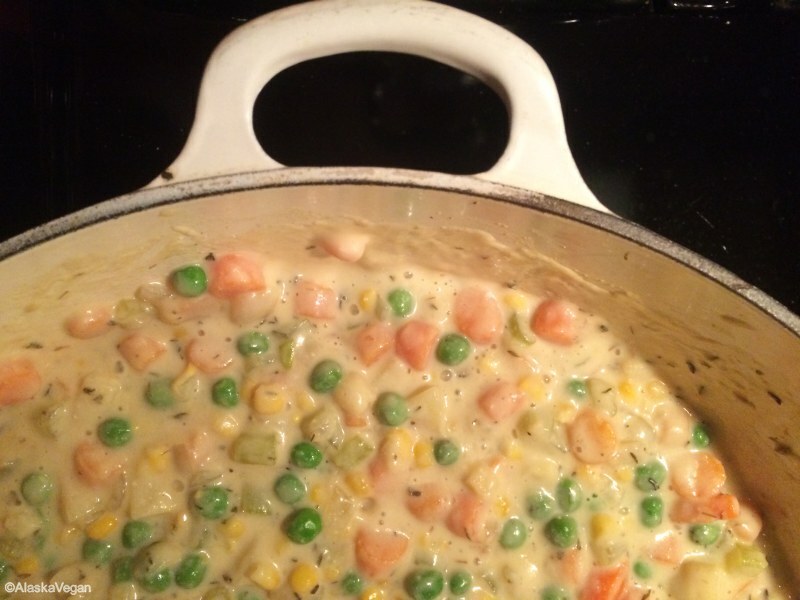 This entry was posted in Entreés and tagged food, pot pie, recipe, vegan on February 9, 2015 by AlaskaVegan. If you’re a local then you know that first grind up to the mine can be a serious slog. 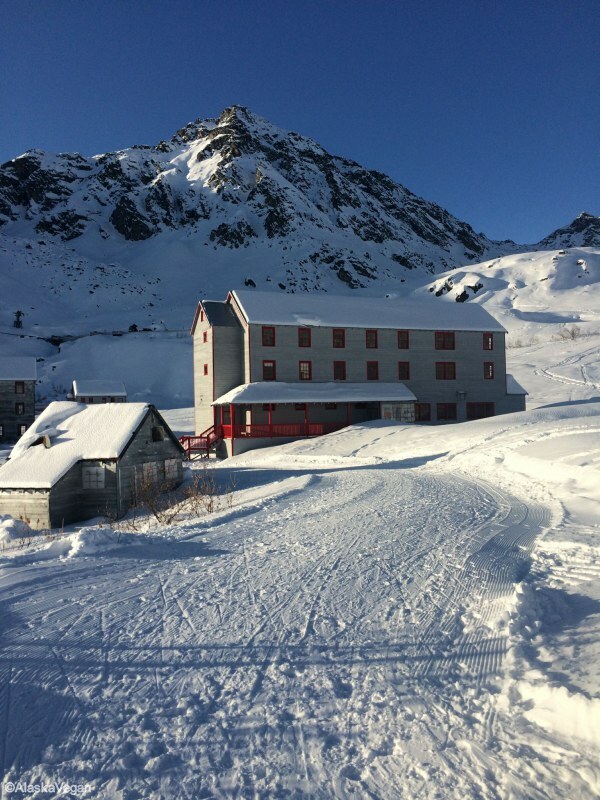 The first few times I went it was in a complete white out – I had no idea how far it was to the mine, how far back to the car, or whether I was really cut out for this Alaska stuff. Back then I never thought that I could have made it on plant power alone, but 10 years and a whole lot of kale later, visiting the ghostly silver buildings on the hill is easier than it ever was. In the last few weeks we have been completely loving this Cabbage Kale and Carrot salad, modified from the Honey Mustard Kale Slaw in Kristy Turner’s amazing cookbook “But I Could Never Go Vegan“. If you haven’t come across this book yet, stop reading and head directly to Amazon. Seriously. This is my variation of her recipe, adding edamame for a bit more staying power and removing the oil from the dressing (mostly because I keep forgetting to add it, and don’t miss it). Since we first made this recipe a few weeks ago, we’ve had it probably 3 or 4 nights a week. So yummy! 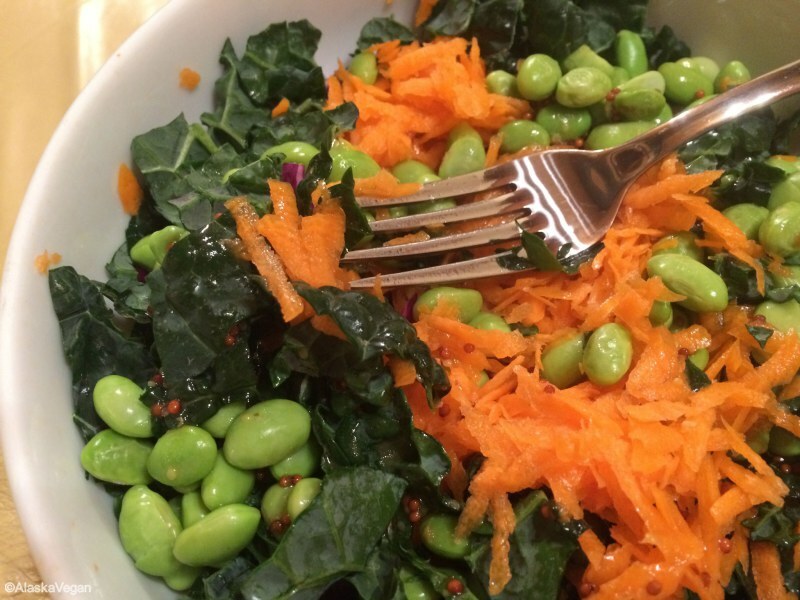 Divide cabbage, carrot and kale and prepared edamame evenly among 4 bowls. Whisk together agave, lemon juice, mustard and salt. Taste dressing and adjust seasoning as needed. Dress the salads and serve! I use Santa Cruz organic lemon juice, mostly for the time savings and because I always have some on hand…unlike actual lemons. This is going to make a lot of dressing, likely more than needed for 4 salads, but if you like this dressing as much as we do, you won’t mind having extra! Returning home on Sunday to catch the 4th quarter of the super bowl with my New England Patriots put the icing on the cake. They always say it’s better to be lucky than good….Pats seem to be both this year. Congrats boys. This entry was posted in Dressings, Salads and tagged agave, Alaska, cabbage, food, lemon, recipe, salad, skiing, vegan on February 2, 2015 by AlaskaVegan. Just as I was starting to wonder whether Alaska Vegan was going to have to be renamed Seattle Vegan, we finally got some snow! Our balmy and snow free days have given way to more typical Anchorage weather and we finally got a few inches of the white stuff. We’re still way behind the curve on snow totals, but being able to cross country ski just minutes from the house instead of hours feels like heaven. Red cheeks, warm woolen mittens and a thermos of hot soup, here I come. 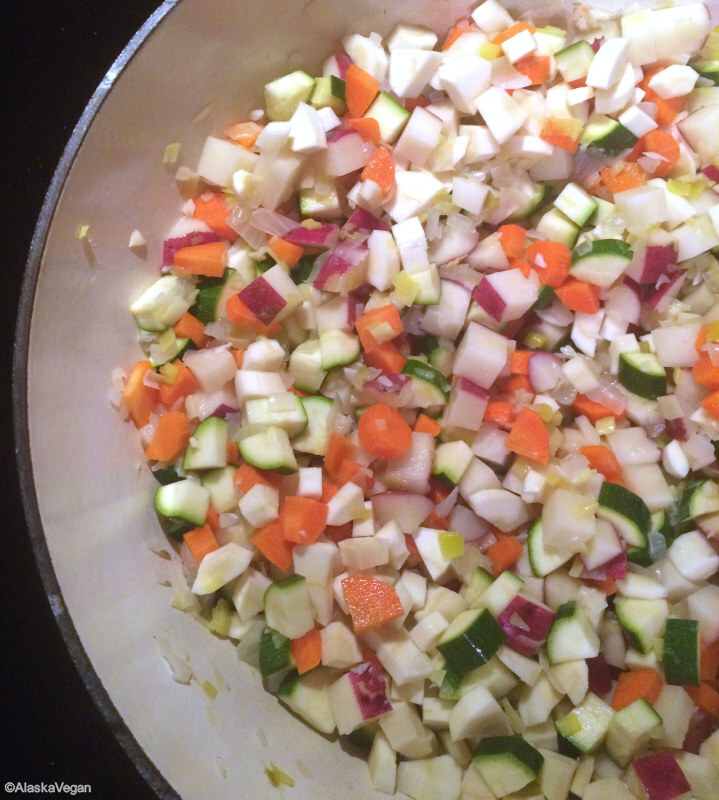 A recent commenter has requested more soup recipes – dear reader, you have read my mind. In weather like this, I can’t get enough soup. Actually in general I can’t get enough soup, but as Gena Hamshaw recently wrote in her delightful Choosing Raw blog, relationships have a way of changing our diets and for us that has meant a tendency towards more calorie dense dinners. Soup alone has typically meant than an hour or so later the man is grazing in the pantry. While he doesn’t seem to mind having to fend for himself, I always feel like I just didn’t make enough dinner and so soups have faded somewhat from the main course….until now. After reading MANY vegetable soup recipes online I settled on a modification of Alton Brown’s Garden Vegetable Soup recipe for testing at home. It was such a hit that my boyfriend requested it two weeks in a row, bringing it to work every day for lunch and sometimes having it also for dinner. I was shocked. Self professed soup lover that I am, even I can’t eat the same soup for that many days or that many meals in a row! Never have I had to keep remaking batches so that it was on hand! This soup will put your knife skills to the test, but if you’re a vegan I’m guessing you’re used to the veggie prep. Make a big batch and get those thermoses ready! Saute leeks, onions and garlic over medium heat until softened, 5-7 minutes, adding small amounts of water as needed to prevent sticking. Add carrots, potatoes and zucchini, saute a few minutes more then add stock and bring to a simmer. Simmer until root veggies are soft, 20 minutes or so. Add tomatoes, kidney beans, corn and cracked pepper, heat through for 5-10 minutes and serve! Leeks can have a tendency to be somewhat sandy, hence the recommendation for the dicing and then rinsing. This entry was posted in Soups and tagged comfort food, food, recipe, soup, vegan, vegetable on January 26, 2015 by AlaskaVegan. Corn chowder is something that goes way back in my culinary repertoire. As soon as the weather turns cold and the mittens come out, I start scouring the cupboards for the creamed corn, and my thoughts turn to ice skating. When I was a kid I used to take skating lessons on Saturday mornings at Groton Academy. I learned the basics, and then at 16 started to teach introductory skating. I remember thinking that I was pretty special when I was asked to be a skating monitor on Sundays for the free skate. Oh the power of being able to determine when the skating direction should change. That was about as far as I made it in my illustrious skating career. Monitor at the public skate on Sundays. I remember being told that I was too tall to really pursue skating in a serious fashion, and that the Ice Capades were all I could hope for…emphasis on HOPE. To be honest it was a relief to be told that my (rather modest) height was an issue, as I’d feared a life of training in what had to be the coldest rink on the East Coast. The temperature in the Groton Academy rink could have been rightly measured on the Kelvin scale – hovering a few degrees above absolute zero. Every week there were children crying, tucking their hands and feet into parent’s armpits. When not warming their children, parents would go outside to warm up, welcoming a blast from a Nor’ Easter in comparison to the frigid arena. It’s a wonder that the physics of skating even held up in there. As anyone from Fairbanks can tell you, there is a point where it is so cold that gliding ceases to exist. I’d emerge from the rink with two frozen bricks for feet, hobbling to the car and dreaming of the hot chowder that was waiting for me at home. Having revived me from near hypothermic states, week after week, this simple recipe of pantry staples has always been one of my favorite comfort foods. Most people that know me well have had this recipe, and despite its humble ingredients list, it continues to be a hit for all who have tried it. Saute onions in medium sized soup pot over medium high heat, adding water as needed to prevent sticking. When onions are nicely softened and lightly caramelized, add non diary milk, potatoes and ‘chicken seasoning’. Bring to a simmer and then decrease heat to low, simmering until potatoes are soft and easily pierced with a fork, about 15 – 20 minutes. Stir in creamed corn. When corn is heated through, off heat, add salt and pepper to taste. Serve! I used So Delicious Coconut milk for the non dairy milk. It did separate at one point, but once the creamed corn was added all was well again. Now for an update on my quest for a meatball / meatloaf replacement. 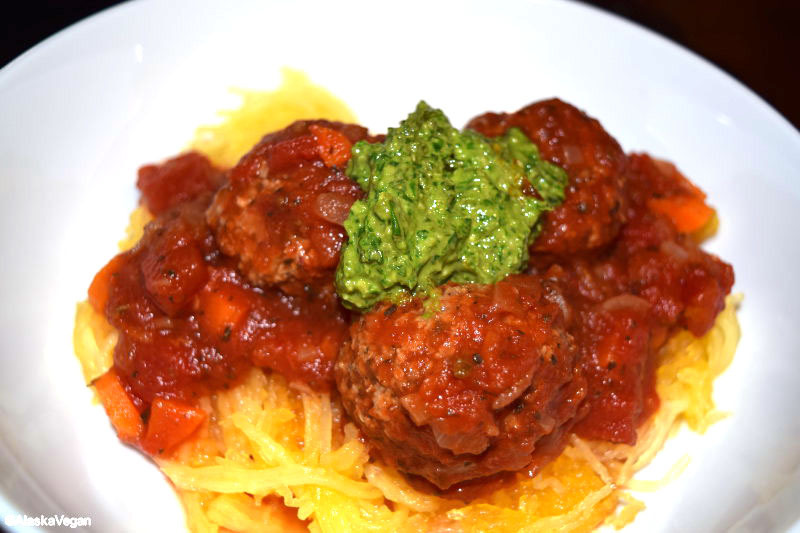 I tried the meatball recipe from Market Street Vegan, and am pleased to say that not only were they good, but that their texture was perfect, just as advertised! I baked mine, per Amanda’s instructions rather than using the slow cooker method. After about 30 minutes they had a nice crust and were firm, not the soft and mushy consistency of my previous experiments. Thank you Amanda! 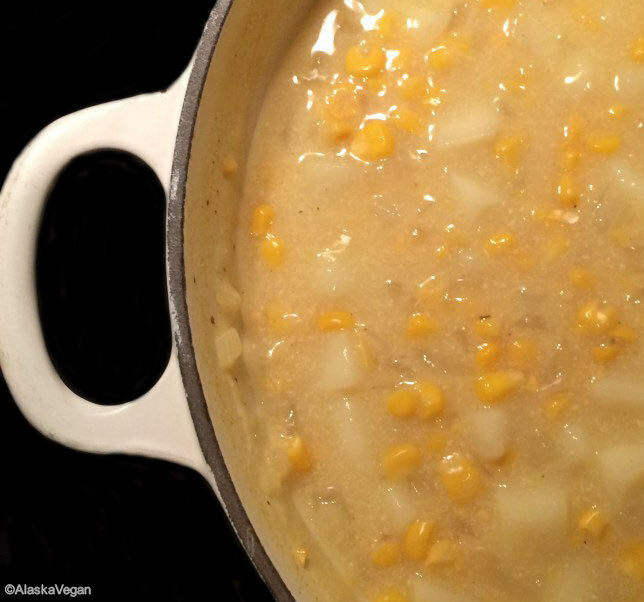 This entry was posted in Soups and tagged chowder, corn, food, meatballs, recipes, review, vegan on November 3, 2014 by AlaskaVegan. 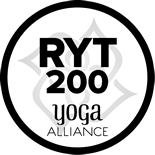 This entry was posted in Breakfast, Puddings and tagged breakfast, food, meat replacements, neat, recipe, rice, vegan on October 27, 2014 by AlaskaVegan. Growing up I remember eating cabbage in one of two ways – either in mom’s coleslaw or in New England Boiled Dinner (a.k.a. Corned Beef and Cabbage). The former is a family favorite, made by my Grandma Pat and passed down to mom (who thankfully honored the recipe, onions and all). It’s cabbage the way it should be: crisp, crunchy and playing the leading role. The latter recipe, on the other hand, was a crime committed against all vegetables involved, but most egregiously against the cabbage. Boiled for hours on end, whole carrots, turnips, potatoes and the occasional parsnip would emerge from the pot liquor beleaguered but recognizable. The root vegetables managed to retain their shape and a hint of their original flavor, but the cabbage was a complete loss – a limp and lifeless jellyfish of a vegetable. With no internal structure, virtually no color, and only a hint of flavoring from the broth, I’m convinced that the cabbage was given top billing in the name of the dish only as some sort of booby prize. This entry was posted in Side Dish and tagged apple, cabbage, caraway, food, recipe, vegan on October 20, 2014 by AlaskaVegan. Where did September go? All month, no post. Now we’re well into October and I still just can’t quite fathom that summer and fall are long gone in Anchorage. First there was the vacation to Montana. I had the best intentions to cook up some new delights in my fancy kitchen in the Treasure State, but the sun and the mountains lured me outside, the amazing vegan treats at the Bozeman Co-op lured me inside, and I figured you’d forgive me a week. Next it was a work trip to Colorado and Utah. Armed with 20 pounds of vegan snacks I smugly intended to eat, write and blog about some of the best vegan travel treats from the hotel in my non-working hours. Ha! That plan went well, as you can see. This entry was posted in Soups and tagged coconut, food, lentil, recipe, sweet potato, vegan, yam on October 13, 2014 by AlaskaVegan.